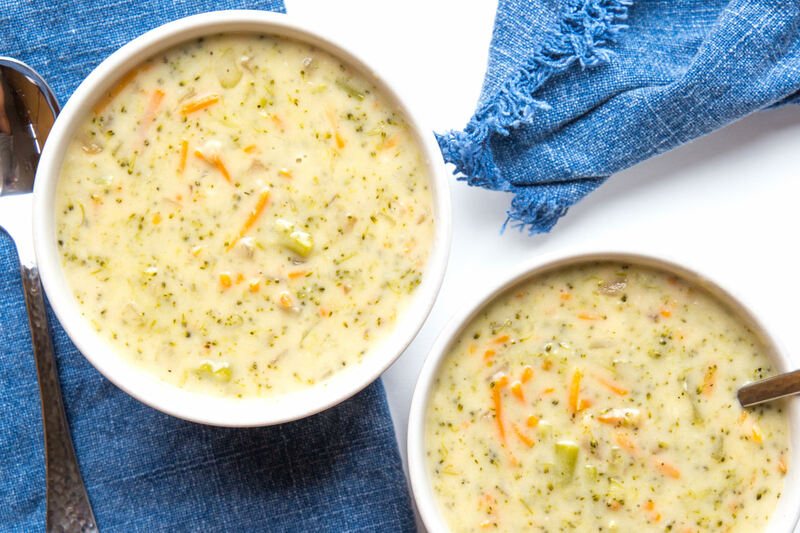 This recipe makes a large batch of America's favorite soup - Panera's Broccoli Cheddar Soup. Sure, it's packed with cheese, but it also has a hefty dose of vegetables! Best of all, it's ready to eat in under 20 minutes. This recipe is so simple and so quick, but yields such a rich and flavorful soup - you won't believe you made it at home. My husband lost his mind over this soup - and devoured the entire pot in just a couple days. It really tastes as close to the Panera recipe as you can get without having their exact recipe - the two soups are practically interchangeable. This is perhaps one of the most impressive examples of how pressure cooking can shorten cooking time so much and making dinnertime a complete breeze. Some quick sautéing, a ONE MINUTE (!!) pressure cook time, a bit of whisking and boom - dinner's on the table! I don't typically buy pre-shredded or pre-chopped vegetables, since they are less fresh and crisp than whole vegetables, but I wanted to make this recipe as quick and easy as possible, so I bought packaged broccoli florets and shredded carrots. The one place I did not use a pre-cut product was for the shredded cheddar cheese. Packaged shredded cheese is coated in a powder to prevent it from sticking together, and that prevents it from melting well and makes it clump up in the soup. Make some crunchy croutons and throw them in the soup, or simply toast some bread and serve it alongside for dipping! Turn pot to Sauté mode on High. Add 1 tablespoon butter to the inner pot, and when it has melted, add the onion and cook for about 3 minutes, or until softened. Hit Cancel to turn off the pot. Stir in celery, carrots, broccoli, and vegetable stock. Seal lid and pressure cook on High for 1 minute. Allow pressure to naturally release for 5 minutes, then manually release remaining pressure. While the soup is cooking, melt the remaining 1/4 cup butter over medium heat, then whisk in the flour to form a thick paste. Raise the heat to medium-low, and slowly pour in the milk, whisking the entire time. Cook, whisking frequently, until the mixture thickens. Whisk in the cheese until completely melted. Open the MultiPot lid and pour in the cheese mixture. Stir to combine. If you want a thicker soup, turn the pot to Sauté mode, whisk together the cornstarch and water in a small bowl, and stir it into the pot. Cook until thickened. Serve immediately or refrigerate and reheat in the microwave in 30 second intervals.